This article is about the Piney Woods ecosystem in Texas. For other uses, see Piney Woods (disambiguation). The Piney Woods is a temperate coniferous forest terrestrial ecoregion in the Southern United States covering 54,400 square miles (141,000 km2) of East Texas, southern Arkansas, western Louisiana, and southeastern Oklahoma. These coniferous forests are dominated by several species of pine as well as hardwoods including hickory and oak. Historically the most dense part of this forest region was the Big Thicket though the lumber industry dramatically reduced the forest concentration in this area and throughout the Piney Woods during the 19th and 20th centuries. The World Wide Fund for Nature considers the Piney Woods to be one of the critically endangered ecoregions of the United States. The United States Environmental Protection Agency (EPA) defines most of this ecoregion as the South Central Plains. The Piney Woods cover a 54,400-square-mile (141,000 km2) area of eastern Texas, northwestern Louisiana, southwestern Arkansas and the southeastern corner of Oklahoma. They are bounded on the east by the Mississippi lowland forests, on the south by the Western Gulf coastal grasslands, on the west by the East Central Texas forests and the Texas blackland prairies, on the northwest by the Central forest-grasslands transition, on the north by the Ozark Mountain forests. It receives 40-52 inches of precipitation annually. A creek running through the Piney Woods in Northeast Texas. Two varieties of wetlands are common in the Piney Woods: bayous are generally found near rivers and sloughs are generally found near creeks. In bayous bald cypress, Spanish moss, and water lilies are common plants. Sloughs are shallow pools of standing water that most trees are not capable of growing in. Other species, such as the purple bladderwort, a small carnivorous plant, have found niches in sloughs. Hardy species of prickly pear cactus and yucca can be found both in the forests and wetlands. Mammals such as eastern cottontail rabbits, eastern gray squirrels, Virginia opossums, nine-banded armadillos, white-tailed deer, North American cougars, gray foxes, bobcats, ring-tailed cats, Rafinesque's big-eared bats, and Seminole bat;  and reptiles such as western cottonmouths, prairie kingsnakes, slender glass lizards, and squirrel treefrogs, thrive in the Piney Woods. Birds include sandhill cranes, black and turkey vultures, northern mockingbirds, and the vulnerable red-cockaded woodpecker. American alligators are not as common as they once were, but their population has rebounded since the 1960s. Louisiana black bears are rare today, but still live in remote thickets. Recently, there has been significant talk of reintroducing the black bear into many parts of East Texas. The most common fish is catfish, which are a native species but also stocked in local reservoirs. Crayfish are common along river and creek banks. Newly cleared forest in East Texas. Most of the mature trees have been cleared and the litter layer—the bottom layer of decaying matter that enriches the soil with nutrients—of the forest has begun to wash away due to recent rains. The majority of the commercial timber growing and wood processing in the state of Texas takes place in the Piney Woods region, which contains about 50,000 square kilometres (12,000,000 acres) of commercial forestland. Four National Forests are found in the Piney Woods of East Texas, covering some 634,912 acres (2,569.40 km2) in 12 counties. ^ a b c "Piney Woods forests". Terrestrial Ecoregions. World Wildlife Fund. Retrieved 2009-06-14. ^ "Ecoregion 1 – The East Texas Pineywoods Ecoregion". Plant Guidance by Ecoregions. Texas Parks and Wildlife Department. Retrieved 2009-06-14. ^ Liu, Changxiang; Jim A. Neal; Craig Scofield; Jane Chang; A. Kim Ludeke; Carl Frentress (2009-06-16). "Classification of Land Cover and Assessment of Forested Wetlands in the Cypress Creek Watershed". Texas Parks and Wildlife Department. Retrieved 2009-06-14. ^ a b "Pineywoods". TPWD Kids. Texas Parks and Wildlife Department. Retrieved 2009-06-14. ^ "Where they Once Roamed". Houston Chronicle. 2005-07-06. ^ "Push grows to make E. Texas bear country". Houston Chronicle. 2006-08-08. ^ "Black Panther Sightings In Upshur County". KLT7 News. 2007-03-28. ^ "Big Thicket National Preserve, Texas : Map" (PODF). Nps.gov. Retrieved 2015-03-12. ^ "The Big Thicket - Big Thicket National Preserve (U.S. National Park Service)". Nps.gov. Retrieved 2015-03-12. ^ "Biosphere Reserves in USA". Unesco.org. Retrieved 2015-03-12. ^ "16 U.S. Code § 698 - Big Thicket National Preserve | LII / Legal Information Institute". Law.cornell.edu. Retrieved 2015-03-12. ^ "Big Thicket National Preserve". Conservationfund.org. Retrieved 2015-03-12. 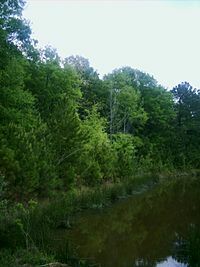 Wikimedia Commons has media related to Piney Woods.